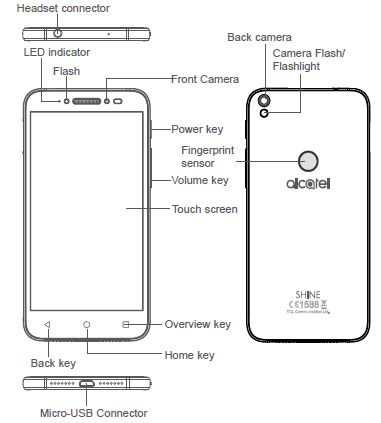 The Alcatel SHINE LITE user manual provide detail reference information such as device layout and Keys and connectors, Inserting or removing the SIM/microSD card on page 19, Lock/Unlock your screen guide, Using the Onscreen Keyboard, using contacts and messaging settings, etc. 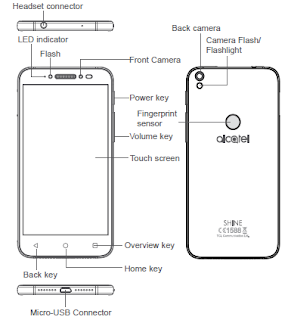 Then about Connecting to the Internet, using Wi-fi and bluetooth, Connecting to virtual private networks, using camera on page 61, tutorial Shooting mode, using Google applications, device settings on page 76,Backup & reset on page 86, Update your phone’s software on page 91 also troubleshooting on page 95. Call, Call log and Contacts.